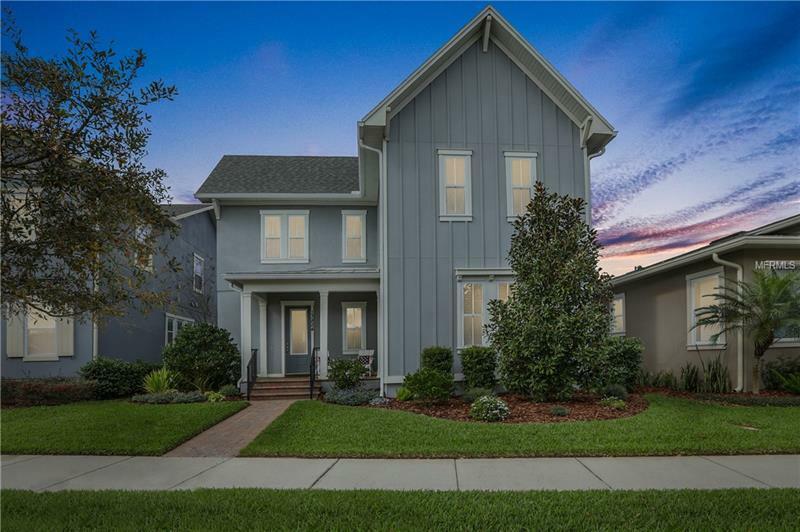 With its modern transitional architectural style, this beautiful two story offers 5 bedrooms, 3 full bathrooms and a 3-car rear loading detached garage located in sought after Laureate Park. This charming home features many custom upgrades and lots of natural light. Upon entering the home through the cozy front porch is the Master suite where you find a super shower with decorative tile, double vanity sinks, and walk in closet. As you continue to the main living area you will find the great room that is open and bright with a cathedral ceiling and built in cabinetry. The modern kitchen has a gas range with built in microwave above, upgraded cabinets with extra storage space, closet pantry and island. An office, full bath and laundry room finish the first floor. Upstairs you find the remaining bedrooms and a bonus room, perfect for playroom, media room or an office. Outdoor living includes a screened lanai with paver flooring and a yard area great for the family to entertain neighbors or friends. The home has a built-in pest control system and energy efficient windows and appliances. You are within minutes to schools, shopping and the Medical City. HOA includes cable, 1 GB of internet, access to the aquatic center, fitness center, multi-purpose facility and a neighborhood restaurant. Come see it today! A one year home warranty is provided.